Sam (Anders Danielsen Lie) went to his ex-girlfriend’s Fanny’s (Sigrid Bouaziz) apartment just to get his stuff back. Busy with her raging party and new boyfriend Fanny neglects her ex who falls asleep waiting for her to give him his things. The next morning Sam awakens alone to a world of zombies. Confined to his exe’s Paris apartment, Sam barricade’s himself into safety while slowly exploring the possibility of life remaining in the outside world. Awoken into the apocalypse, survival is your first instinct. Days spent alone explore the psychosis of solitude. Eventually the question is brought to existence, is it better to just survive or to live? 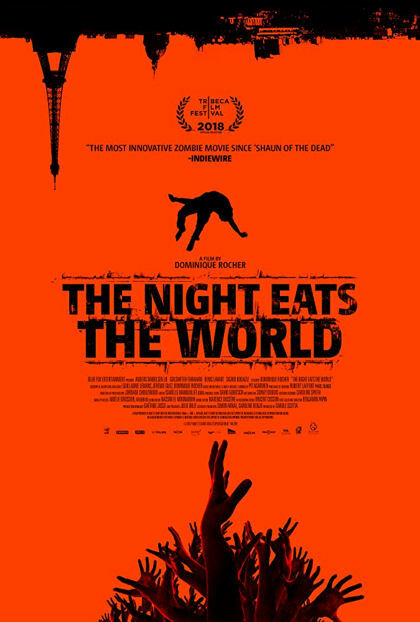 Anders Danielsen Lie nearly performs a one man show in a zombie film that is more than just your typical a grouping together of survivors in a zombie apocalypse. Sam goes at it alone thinking he’s the last person on earth. Afraid to find out if he’s right, afraid to find out is he’s wrong. An English language French film adapted from the novel by Pit Agarmen. Director Dominique Rocher pulls off a successful entertaining feature with a cast of mainly one actor and the occasional zombie. Captivating from the beginning, it’s not all death defying tension that keep the viewer enthralled. Credit goes to both director Rocher and Anders Danielsen Lie for maintaining interest in a film that stands as alone a Cast Away. A feat not easily accomplished even by the most experienced of filmmakers let alone a first time feature director and up and coming actor. In a Walking Dead world where zombies have reached their peak and grown stale, innovative stories like Pit Agarmen’s bring new ideas into filming a world of the walking deceased. You fall asleep and The Night Eats The World. Simple, different and entertaining.